You’re just few steps away from downloading VidMate for Android. Q: APK file not getting installed. 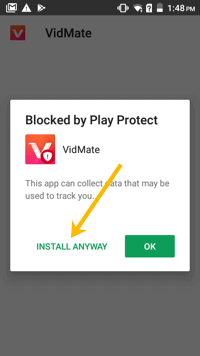 Because VidMate is a third party app (i.e. not from Google Play) the device security will block the installation. In order to avoid it make sure you’re allowing app installation from “Unknown Sources“. If not already go to Settings > Security > Device Management > Turn on “Unknown Sources”. Q: Blocked by Play Protect.